As Uttarkhand struggles to restore normalcy in the state which was struck by floods and landslides in June this year, experts are debating the best way forward for the state to balance development needs with sustainability. A workshop to debate the matter was organised in Dehardun by the Wadia Institute of Himalayan Geology over the past two days; the event was co-sponsored by the National Disaster Management Authority (NDMA). A three-member team will give the final recommendations of workshop in a couple of days. The workshop—Mountain Meteorology and Landslides: A workshop On Way Forward With Special Reference To Landslide in Uttarakhand—aimed to get experts' views on rebuilding the state, which would help the state frame an appropriate policy for the Himalayan region. Most participants demanded the recommendations should lay emphasis on implementation. A K Pachauri, senior consultant with the National Disaster Management Authority (NDMA), who is also a member of the team that will finalise the workshop recommendations, briefly outlined the main recommendations. He informed that the India Metrological Department (IMD) will make new plan for technical upgradation in the Himalayan region, Geological Survey of India (GSI) will conducts surveys of landslides and the National Remote Sensing Agency (NRSA) will prepare a data base. “We can get 70 per cent more accurate data if IMD proposal of installing new equipment gets implemented,” he said. V K Duggal, member of NDMA, said that the state Cabinet is very serious for this report and emphasised on the need for specific recommendations based on analysis. “The gathering is the first part of our excercise and our work has started now,” he said. “If the quality of the report is good, I assure you that NDMA will try to implement it and I will also pursue the matter if it comes in others' jurisdiction,” he said. A few recommendations that would require funds could face problems, but all recommendation for at least the governance model can be implemented, he said. IMD has already started setting up systems to avoid such disasters in the future. Scientist with IMD, B P Yadav, said that commissioning of nine new Doppler Weather Radars in the Himalayan region covering states of Uttarakhand, Himachal Pradesh and Jammu & Kashmir has been done. Apart from this, 18 Micro Rain Radars (MRR) are also being installed for measuring rain rate, liquid water content and drop size distribution from near ground to several hundred metres. It is also used for now-casting of rains—it can help detect the start of rain several minutes in advance. Apart from this, commissioning of seven GPS-based U/A system, 10 lightning detection devices will help track thunderstorm activity in real time. It is very useful in nowcasting, and is especially useful for the aviation sector. IMD has also commissioned 12 compact severe weather detection radar systems which is used for the detection of rainfall intensity at short ranges and is ideally suited to provide forecasters with detailed information about local rainfall and early warnings of approaching storms for operational forecasting. These systems can show minute-by-minute information on the path and intensity of rainfall and suitable for gap filling in existing radar networks and can also be used as a mobile application. IMD is implementing similar measures in the north-eastern region. In uttarakhand, landslides were the biggest culprit behind the devastation (see https://www.downtoearth.org.in/content/what-really-happened-uttarakhand). Experts at the meeting suggested that emphasis should be given to landslide monitoring. V K Sharma, director of Geological Survey of India (GSI) in Dehradun said that management of landslides, a natural process which is part of geomorphic evolution of a region, can be managed if mitigatives measures are adopted. Vulnerability may be reduced to a great extent, if forecasts are timely, he said. In the wake of recent floods and landslides, Uttarakhand has drawn up an elaborate programme for mitigating landslides. 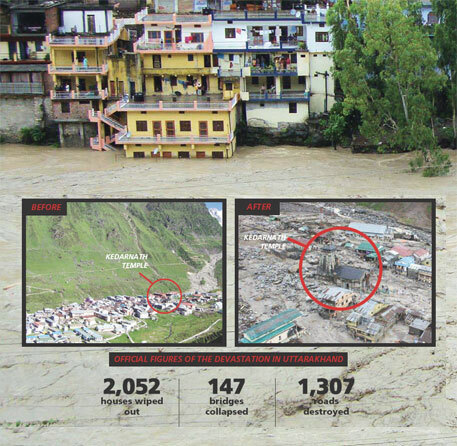 In the five worst-affected districts of Uttarakhand—Rudraprayag, Chamoli, Uttarkashi, Bageshwar and Pithoragarh—preliminary geological assessment has been initiated. GSI studies would focus on rehabilitation of villages and a few state highways and village roads, demarcation of landslide susceptible zones and suggest suitable sites for rehabilitation, Sharma informed. He also emphasised on site-specific studies. Tapas Ranjan Martha from the National Remote Sensing Centre (NRSC) at Hyderabad emphasised on the landslide inventory methodology. D P Kanoongo from Central Building Research Institute (CBRI)-Roorkee emphasised on good research and unconventional ways of to approach a problem. Anand Sharma from IMD, Dehradun said had predictions been made and warnings given before the disaster, many casualties could have been averted. M M Kimothi from USAC Dehradun spoke on rebuilding the confidence of people who have suffered most. This is the most important issue at present, he said adding that lot of research is available and must be used. “We have to look at what scientific strategy we should opt for sustainable strategies,” he said. He said that disaster is not new to the state. Such incidents have taken place earlier also in 1970 and 1998 but the difference was that the casualty was high this time. It happened because people have started living there. After the 1998 disaster, a committee was constituted to look into the matter and recommend the way forward. He said that committee given recommendations similar to those proposed during the workshop. But the recommendations were never implementated. What is needed is implementation of already existing knowledge, he said. Ravi Chopra from People’s Science Institute and managing trustee of Himalyan Foundation said an effort was made earlier after the floods in 1970. Quoting chief minister Vijay Bahuguna who while inaugurating the workshop said advance warning could have minimised loss of lives, Chopra said that warning had been given in advance. “If we don’t admit lapses from our part, I feel we will continue to commit similar mistakes,” he said, adding that when one makes good suggestions for development work, there are a lot of dilly dallying in the name of lack of time and money. “In hindsight, would it not have been cheaper if previous recommendations had been implemented,” he said. For example, there are regulations for construction of dams, but companies try to circumvent them, he added. Abiding by the law and going through the prescribed process could take more time and money, but it will help society in the long run, he said. While inaugurating the workshop, the chief minister clarified his position. He said he was not propagating dams but fact remained that the Tehri dam saved a few areas from being washed away. He emphasised on the balance between ecology and development while rebuilding the state and sought suggestions from experts and civil society to achieve this target. He announced that the state has planned to make a Uttarakhand disaster task force. Landslides have become perennial issue for the state which is causing a lot of loss, destruction. What should be done to lessen its impact? he asked, while inviting suggestions from the experts. He said regulating pilgrimage and tourism should should also be also part of planning.